Former Starbucks CEO Howard Schultz is thinking about running for president as an independent, and liberals are not happy about it. Neera Tanden, president of the Center for American Progress and former Hillary Clinton adviser, said she would start a boycott of Starbucks. Ian Millhiser, "justice editor" for Think Progress agreed. Brian Fallon, Clinton's former campaign spokesman, called Schultz a "villain." It is hard to top Ralph Nader, Joe Lieberman, and Mark Penn on the all-time list of villains, but Howard Schultz is going to give it his best shot. Vox blogger Matthew Yglesias suggested Schultz's potential candidacy could be a conspiracy to reelect President Donald Trump. CNN's Ana Navarro suggested Schultz is another "big ego" with "deep pockets" being hoodwinked by consultants. Schultz has hired an "elite PR team" headed by ex-Republican Steve Schmidt. Trump was a fluke. Annals of history full of ppl w/big egos and/or deep pockets, who fell for consultants’ siren song that they could make a difference running as 3rd Party candidate. Perot, Nader, Jill "Russia Today" Stein…all asterisks for "spoilers". Et tu, @HowardSchultz? 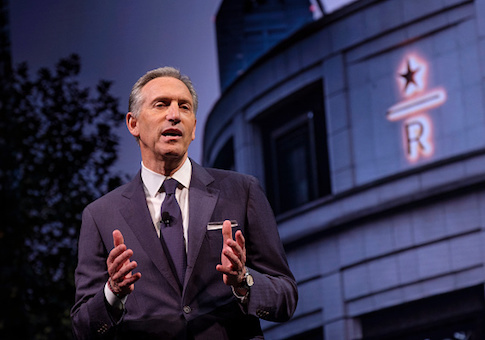 Others echoed calls for boycotts of the billionaire's coffee empire, but said Schultz could unite the country. For the sake of our nation and future generations, @HowardSchultz, please set aside your ego and DO NOT RUN. It's a dangerous fiction to presume that America's problem is merely a lack of civility and bipartisanship. The REAL problem is that the GOP has become a tool of rightwing extremists hostile to US democracy. Finally, Free Beacon man of the year Michael Avenatti weighed in on potential unintended consequences of a Schultz run. The likelihood of an independent winning the WH in 2020 is ZERO. But the likelihood of a serious, well funded independent helping elect Trump is close to 100%. 2020 is not the year to try and change the two party system. If @HowardSchultz wants to run, he should run as a D or R.
This entry was posted in Politics and tagged 2020 Election, Howard Schultz. Bookmark the permalink.